Whale watching on Straddie is eagerly awaited each year by residents and visitors alike. From April to November the majestic humpback whales pass close to the island on their annual migration from Antarctica to their calving grounds in the warmer northern waters close to the Barrier Reef, and back again. There goes another one!... 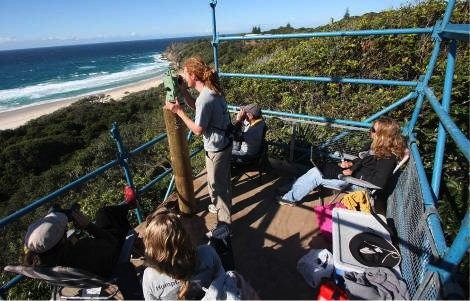 UQ whale researchers count migrating humpback whales from a platform above Frechman’s Beach. The whaling industry almost wiped out the humpback whale by 1960. An annual survey of their numbers began 1980. In more recent times Dr Michael Noad from the UQ Vet School at Gatton has been observing, counting and collecting data as part of The East Coast Australian Humpback Whale Survey. 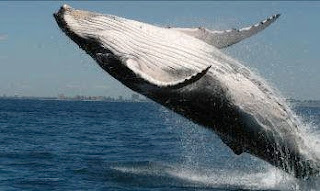 The humpback whale (megoptera novaeangliae) is the fifth largest of the great whales. 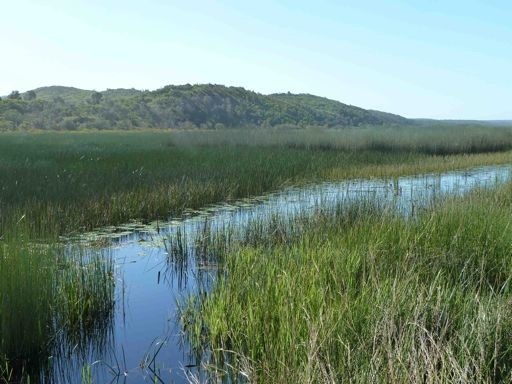 Adult females can grow 15 to 17 metres long and weigh 30 to 40 tonnes. According to Dr Noad, there has been a very strong and consistent recovery of numbers of between 10-11% per year. He said the survey showed that this increase might be slowing down this year, which was a good sign and may be halfway to the number when it will finally taper off. Researchers reported many interesting sightings this year including a large pod of killer whales that were seen chasing the humpbacks southward. Big breach!... a whale breaching off the east coast. Between April and September the total migratory population of whales passing Point Lookout is approx. 15,000, and the daily number between 70 and 100. Before leaving Antarctica the whales feed all summer, eating 1⁄2 tonne of krill per day. 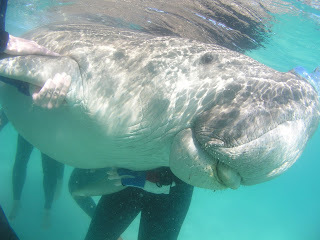 This puts on a huge layer of blubber, sometimes a metre thick, which sustains them on their eight month journey. As they pass by we see spectacular breaches and fin slapping. Males and females breach for a number of reasons but when it comes to mating rituals, breaches can occur to impress one another or to intimidate competition. Gestation takes 11 months and calves are born 3-5m long and weigh two tonnes. The mother feeds the baby for almost a year and produces 240 litres of milk per day. Whale milk is the constituency of chewing gum and between 40-60% milk fat so the baby develops well, by which time it will have doubled its length. In the meantime the mother will have lost 4,000kg by winter’s end. Sound is of tremendous importance to humpback communications, and they are thought to produce 640 different vocalisations; males sing complex songs comprised of verses and sets, lasting 20 minutes and repeated continuously for hours at a time. Songs are unique to different regions in the world. The survey site for the UQ count was a platform overlooking Frenchman’s Beach. This was generously erected by the Redland City Council under the direction of Dan Carter. Dr Noad and his team are extremely grateful for this assistance in their research.